Writing a new fluid dynamics textbook is a challenging task. In 1895, Sir Horace Lamb established a very high standard with the first edition of Hydrodynamics. This classical presentation was followed by other excellent introductions into the field of fluid mechanics, among them Landau and Lifshitz, 1959, and Batchelor, 1967. The strength of M.Belevich’s book is in its rigorous and systematic approach to developing the mathematical model of fluid dynamics from the first principles. It carefully explains the underlying hypothesis and simplifications used to establish equations that govern motions of a fluid. Extensive use of vector and tensor analysis results in a compact and generalized narrative, without the restrictions of a particular coordinate system. This textbook is by no means a comprehensive description of the field of fluid dynamics. Some of important problems (e.g. waves) were deliberately left out of the book’s framework. Since the text is based on a course that is taught to students who specialize in geophysical fluid dynamics, more engineering aspects of fluid mechanics (such as turbomachines and airfoils) are also not covered. The book’s content not only provides a general description of fluid dynamics, but also teaches how to apply universal principles to build a mathematical model of a particular problem. The distinctive feature of M. Belevich’s book is a somewhat non-standard approach of describing the dynamics of fluid from the point of view of the observer (chapter 15). It allows to underline some physical aspects of fluid mechanics which are usually not explicitly established in most textbooks. The book is complemented by a carefully selected set of exercises. It provides consistent and self-sustained introduction to fluid dynamics, giving enough details to be used either in class or for self-study. It can be used to acquire knowledge in particular aspects of hydromechanics, and also as a source of inspiration for students, researchers and teachers in the field of classical fluid mechanics. This book presents the basis of the classical fluid mechanics and its content corresponds to a one-semester course which I am teaching from past several years to the 2nd year students of the Russian State Hydrometeorological University in St. Petersburg. The goal of this book is twofold. Firstly, I wanted to provide a reader with a holistic idea of the fluid model and the way it is constructed. To show him, how the model of the fluid is developed, what main hypotheses lie in its basis and what general conclusions based on observations (the so-called laws of nature) make up the model. Secondly, I wished to demonstrate some possible modifications of the initial model which either make the model applicable in some special cases (viscous or turbulent fluid) or simplify it in accordance with peculiarity of a particular problem (hydrostatics, two-dimensional flows, boundary layers, etc.). The whole theoretical material of the book naturally falls into two parts. The first part is fully dedicated to development of the model of the fluid in the Cauchy form. Here, the basic notions are introduced, main hypotheses are discussed and necessary postulates, which actually make up the model of continuum, are formulated. Non-coordinate tensor form of equations is actively used. This shortens formulas and makes results more readable. With that end in view, a brief introduction in tensor analysis is given in Ch.4. This part results in derivation of the perfect fluid model which turns out to be the simplest although quite efficient model. In the second part of the book the most important modifications of the developed model are considered. First of all this concerns the redefinition of the stress tensor which is needed when viscosity is taken into account. Another important modification is connected with averaging of equations of the model which is necessary in case of turbulent flows. The concept of the boundary layer is also rather fruitful. Both laminar and turbulent boundary layers are discussed in Ch.14. It is clear, that all this does not exhaust theoretical fluid mechanics, and that in the study of many important problems, it is necessary to refer to other books, at times rather special. However the basis of all such particular cases of the fluid mechanics is the same, and this book is aimed to discuss this topic. Exercises and problems which are solved by students in practical classes are integral part of this book. They are chosen so as to teach students to work with complex systems of differential equations, since different fluid models are just such. We are training skills in writing equations in vector-matrix form, transition to component form of notation, applying of the index summation convention. Special attention is paid to formalizing of a verbal description of a problem (choice of coordinate systems, their orientation, accounting directions and symmetries inherent in the problem, etc.) as well as the mathematical problem posing. The system of fluid mechanics equations is quite complex and does not have analytic solutions in most interesting cases. Therefore, the main goal of these exercises is to elaborate the ability to see a particular problem from different viewpoints and to estimate its possible simplifications. Theoretical fluid mechanics is very mathematized discipline, so the reader must meet certain requirements. Knowledge of the following topics of algebra and calculus is assumed: determinants, matrices, eigenvalue problem, vector spaces, calculus, vector analysis, differential equations. All required information about tensors is given in Ch.4. Besides my explicit and implicit teachers, I would like to especially thank those of my friends and colleagues, who patiently and sometimes willingly discussed with me various aspects of this course. These are primarily Dr. S.A.Fokin and A.A.Tron’. Their remarks, comments and suggestions were very helpful. The subjects covered in the book are relevant to mathematical models of fluid dynamics. The hypotheses which define objects of study, axioms, underlying the described models, and the consequences arising out of these hypotheses and axioms are rigorously and carefully examined, and their physical meaning is explained. Only in a few textbooks on fluid mechanics, are considered the meanings and concepts of "intuitively obvious" basic objects of study, and as a result they are misunderstood or even not formalized at all. The narrative of the book begins from the very basic mathematical definition of fluid body, description of its motion, mass conservation law, concept of force etc. The key point of theoretical fluid mechanics - continuity hypothesis is discussed in a very detailed manner. Special attention is paid to its physical meaning and the region of its applicability. Integral and differential conservation laws together with equation of state forming the closed system of equations for fluid model are presented rigorously. 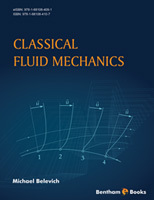 The distinguishing feature of this book is the different applications and simplifications of the fluid model, presented in Part 2, which includes beside their description, the discussion of the problems posing for particular fluid models like perfect or viscous fluid, boundary layer model, approaches for turbulent flows description, free convection etc. As the author of the book emphasizes: "Any model is an attempt to give a simple description of a complex phenomenon," and one can expand this sentence: it is desirable to use the simplest model to adequately describe any particular problem, but not too much simple! What characteristics of fluid motion have to be described and what may be omitted, what problems may be adequately investigated by the presented models - such kind of analysis is widely presented in the book. The explanation of the basic models of fluid mechanics theory and its applications are very clear and reader can easily “catch” it with a minimum of mathematical education. But in any case, the minimal necessary information about vector and tensor analysis is presented in the book. The book also includes a carefully selected set of exercises that should help the reader to "check" the understanding of the material presented. Finally speaking, the text book of M. Belevich outlines a consistent and rigorous approach to the fundamentals of fluid mechanics theory and will be useful for readers of all levels from students to professors weighed down by the diverse knowledge in the subject. Hydromechanics is rather a mature discipline. It has long been taught in various universities, and there are a fair number of textbooks outlining it. What are, then, distinguishing features of M. Belevich's book "Classical Fluid Mechanics" against such a background? Among them are the following. Firstly, it is an emphasis on the basics. The book is addressed to people first encountering the construction of mathematical models of physical objects. Here, the fluid is chosen as such an object, and construction of a mathematical model is performed on its example. Secondly, this is a systematic presentation of the material. Construction of the simplest model of a media (model of the perfect fluid), which is the subject of the entire first part of the book, is discussed in details. The fundamental hypotheses are described, and the laws of nature with corresponding postulates are formulated. Finally, the basic system of differential equations is derived. The second part of the book is devoted to considering of examples of usage of the constructed model. On the one hand, these are variants of simplification of the model in some specific cases, and on the other hand these are the model modifications in order to extend its range of applications (for example, to describe viscous or turbulent fluid). And thirdly, along with the presentation of the classical material in the appendix to the book, one of the possible variants of generalization is also given. The existing standard theory describing the motion of a viscous fluid does not satisfy the causality principle, which in some applications is a serious drawback. The generalization given in the book makes it possible to avoid this problem. The book contains a considerable number of tasks and exercises for the practical work of students. They are carefully chosen so that to illustrate the appropriate theoretical material. Many of them are equipped with answers, which will allow students to independently track stages of the solution and its nuances. The book is compact, which is largely achieved via active use of tensors and non-coordinate form of writing down of mathematical expressions. Such an approach makes it possible to create an easily readable text without focusing on the exclusive use of the Cartesian coordinates and corresponding Cartesian bases. Summarizing, it should be noted that the book will be useful to all of those who want to understand how, and why so, a mathematical model of a fluid is constructed. It is designed to lay the foundation, which will allow one to master other, much more special branches of fluid mechanics.